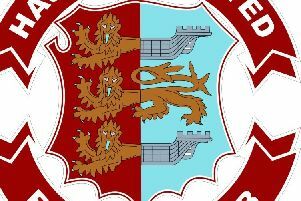 Little Common Football Club has become renowned for scoring goals in recent seasons and this term promises to be its best yet. The Commoners achieved the splendid feat of netting a century of Macron Store Southern Combination League Division One goals in 2016/17, a 5-0 final day win away to Midhurst & Easebourne giving them a total of 103. Lewis Parsons heads for goal against Storrington in September. With eight league matches to go in 2017/18, the league leaders are on course to eclipse that figure having netted 89 in their first 26 matches. What’s more, Common are up to 103 in all competitions. That tally of 89, incidentally, is more than any team has managed in the entire league, including the reserve, under-21 and under-18 divisions. Common are also among the leading scorers at step six level in the country. The club’s biggest source of goals has again been Lewis Hole, who could well end up with his most prolific season to date. Liam Ward and Wes Tate tussle for possession against Bexhill United on Boxing Day. Common’s all-time record scorer has cracked the 30-goal barrier in four previous seasons, the most productive of which was last term when he netted 38 times in all competitions. Hole is up to 34 in all competitions during the current campaign and is the division’s leading scorer with 30 league goals - more than Southwick’s entire team has managed and the same as Storrington. Six more over the next two-and-a-bit months and the club captain will reach the magic 40-goal mark for the first time. Hole’s overall tally for the club, by the way, now stands at a quite remarkable 312. While Hole leads the way, Common’s goal tally is certainly not all down to him. Jamie Crone has plundered 21, Sam Ellis has bagged 15 after making the step up from Division Two side Westfield, Wes Tate has scored nine from a deeper role this term and dead ball specialist Russell Eldridge - the club’s player-manager - has eight. James Maynard and Harry Saville close down a Hailsham Town opponent at the end of January. Fourteen players in all have found the net for Common this season, including goalkeeper Matt Cruttwell, who scored with a huge kick from his own penalty area against Selsey last month. Although the goals scored column is always the one which catches the eye, Common have also enjoyed a decent season at the other end of the pitch - something which hasn’t always been the case down the years. Despite influential defender Dan Cruikshank not playing this term, Common possess comfortably the best defensive record in the division having conceded just 26 league goals. Put the goals scored and conceded columns together, and you get a tremendous goal difference of +63 - again by far the best of any team across the league’s various divisions. Common have also shown an ability to get results in all conditions, as was proven recently when they beat Selsey and Hailsham Town on wet, muddy pitches before easing past Steyning Town 5-0 on a completely different artificial 3G surface. With around three-quarters of the season gone and a seven-point lead at the top of the table, it’s so far so good for Common. Now comes the task of finishing it off. Southern Combination League Division One top half (played-points): 1 LITTLE COMMON 26-67 (+63 goal difference), 2 Langney Wanderers 25-60 (+47), 3 Lingfield 24-52 (+42), 4 Ringmer 26-45 (+17), 5 Wick 23-44 (+28), 6 Mile Oak 26-44 (+9), 7 BEXHILL UNITED 26-43 (+22), 8 Selsey 24-40 (+10), 9 Hailsham Town 23-32 (-5).